Sci-fi traveling used to be -- and sometimes still is -- a lot more basic and easily grasped. Journeys to the center of the earth invariably encountered prehistoric monsters and other perils before a light at the end of a chasm. Time travels mixed in a little history lesson along with the overriding coda that altering the past could have major consequences for the future as well. And if you instead are in the earth-bound future, well, it’s never a happy place because totalitarians in one form or another are ruling over a decimated planet. NBC’s Reverie is more complicated and convoluted than that. Its terrain in large part is “a highly advanced virtual-reality program in which you can literally live your dreams,” the network tries to explain in publicity materials. Ah, but there are problems. Some people don’t want to come back. And those people are now in comas and near death. So what’s needed is a former hostage negotiator who can also take this trip and then talk the endangered into returning. Former Dallas Cowboys Cheerleader Sarah Shahi, who also co-starred in CBS’ Person of Interest, has the lead role of Mara Kint. Of course she also needs saving after failing to talk down the crazed husband of her sister and their little daughter. He instead killed them both before turning a pistol on himself. Mara has been hitting the bottle and imbibing too many pills ever since. But former police chief Charlie Ventana (Dennis Haysbert in his first series role without hair) sees her as the perfect choice to be a daring and deft virtual-reality guinea pig. “Reverie is a place where the impossible becomes impossible,” he tells her. “That’s like a trip to heaven,” says she. But, no. Not really. The initial Reverie straggler is a guy who’s never gotten over the death of his wife. After being reunited with her, he’s in no mood to return. But in the real world, he’s left behind a little daughter who wants her daddy and a brother who also fears the worst. Mara is taught the ropes by hunky Paul Hammond (Sendhil Ramamurthy) after she’s first injected with an implant. The magic words are “Exodus” if she wants to extricate herself from perils such as a sealed box with rapidly rising water. But other members of the Reverie staff fret about the unknown consequences of a second person entering this realm. What if that proves to be doubly life-endangering? 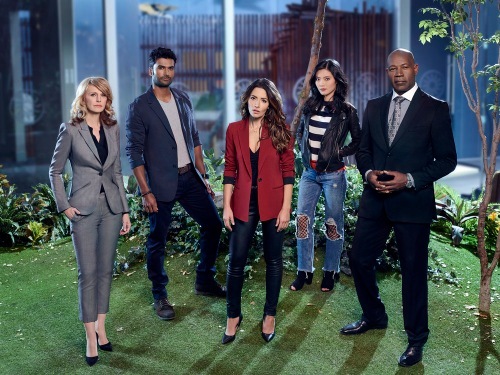 NBC originally announced Reverie in May 2017 as a midseason replacement series that later was earmarked for a March premiere. Two months later, and with a shortened order of 10 episodes, here it is. And that’s generally not a good sign, whatever world you might be in. Reverie is brightly colored and nicely designed when it’s tripping. But it’s also all over the place, and probably not worth the overall trouble of trying to grasp whatever the rules of this game are, were or will be. By the end of the premiere hour, Haysbert’s Charlie is meeting with some sort of corporate schemer (Kathryn Morris as Monica Shaw) while Mara is having a rather startling real world vision. But none of this is gripping enough to make the sale. NBC would be far better served by renewing its time-traveling Timeless for a Season 3. The series even has a prominent champion in Kelly Clarkson, who just wound up her first season as a coach on NBC’s The Voice. Reverie seems unlikely to get a “Brav-freakin-o!! from Clarkson or anyone else. At best it’s merely so-so.